So far, a true treatment for Alopecia in its various forms, has evaded all scientifc research. As a result most studies and statistics referencing Alopecia and hair fall, have substantially overestimated the non-curability and nature of this disease. Statitics such as: 80% of Alopecia cases are Androgenetic, 100 hairs are lost everyday, Or hair growth only occurs at a rate of 1 inch every two months, are simply in-accurate as per our perspective. They stem instead from the failure of current medical science to truly address the problems of Alopecia, and placing blames on stress, water or diet while purposely ignoring the chemical nature of most if not all cosmetic products used daily by people such as shampoos, lotions and others. 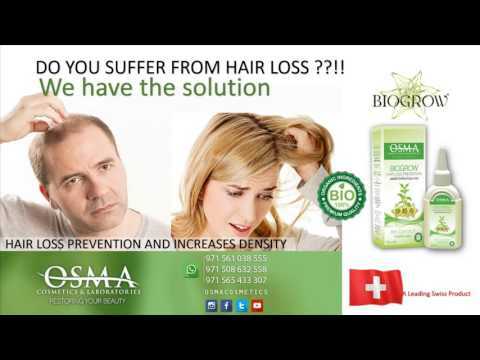 OSMA was incorporated by Mr. Omran Alhallami after his discovery of BIOGROW ®, the true solution to hair fall, dandruff and other scalp problems. OSMA's approach departs from using any synthetic chemicals that could have harmful effects on the human body. OSMA instead formulates its revolutionary and completely natural products according to Phytochemistry and Anthroposophy as set out by Dr. Rudulf Steiner.